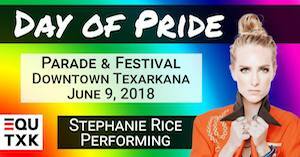 2018 “Day of Pride” Saturday, June 9 at 10:00 a.m.
Texarkana, USA – The non-profit group, Equality Texarkana, will sponsor a “Day of Pride” Parade and Festival this Saturday, June 9, in downtown Texarkana. The event will start officially at 10:00 a.m. with a parade, followed by a picnic at 11:15, entertainment at 11:30 and a raffle at 3:00 p.m. The public is welcome and encouraged to participate throughout the day’s events. This year the “Day of Pride” event will feature two nationally known guest. Stephanie Rice, a recent major contender on the NBC television show The Voice, will serve as the MC and perform during the entertainment portion of the event. Ms. Rice shared her history while on the show The Voice. She suffered through being disowned by her family when she came as a lesbian out at eighteen. Despite being alone and facing the world, Ms. Rice was able to attend college, earn her degree, contribute to HIV research, and become a major contender on The Voice. Ms. Rice used her birthday celebration on Facebook to raise significant funds to assist Equality Texarkana in putting together this year’s “Day of Pride”. Another special guest this year will be speaker Kimberly Shappley. Mrs. Shappley is a conservative Christian mother who found herself in the position of having a transgender child. Her acceptance and encouragement that she promoted toward her child and to others has caused her story to be featured on The Today Show, and other shows and networks. Articles about Mrs. Shappley have appeared in Good Housekeeping, the Huffington Post, and many other publications. Mrs. Shappley is an R.N. and an ordained minister. She has spent her life proclaiming love and acceptance to churches in Texas, Louisana, and Mississippi. In addition to the scheduled events, the day will also feature vendors, games, and various other events throughout the day. The event is open to anyone and the public is welcome and encouraged to attend. Equality Texarkana is a 501 (c) 3 organization promoting equality and fairness for all people regardless of race, religion or sexual orientation. To learn more about Equality Texarkana or the “Day of Pride” event, see the webpage at Equality Texarkana or the Facebook Page. More information about Stephanie Rice may be obtained at her website- Stephanie Rice. More information about Kimberly Shappley may be obtained at her Faceook page – Our Faith in Transition. Texarkana, USA - Equality Texarkana held their monthly social dinner at Pop's Place on Highway 67 Saturday evening at 6:00 p.m. Roughly 20 people attended the event held for visiting, meeting new people, and perhaps most importantly...eating. Equality Texarkana is a non-profit 501 (c) 3 organization located in Texarkana, Arkansas and serving Texarkana, USA, and the surrounding areas. The group strives to encourage equal rights and representation for all people regardless of sexual orientation, religious beliefs, or nationality/heritage. While the group has a central focus on the LGBT community, they have members from all walks of life in the organization. The group offers support meeting for family members, people dealing with social issues, and for people dealing with bullying issues in schools and in the community. The group has had national celebrity support and political leaders support as they have continued to grow.